Featuring Scotland’s own Christian, The Swingcats and full supporting cast, this production follows the introduction of the Jukebox days, with hits from The Drifters, Neil Sedaka, Connie Francis, Chubby Checker, Elvis, Eddie Cochrane, The Shangri’Las, The Tamla Motown Years, The Supremes, Frankie Valli and lots lots more. 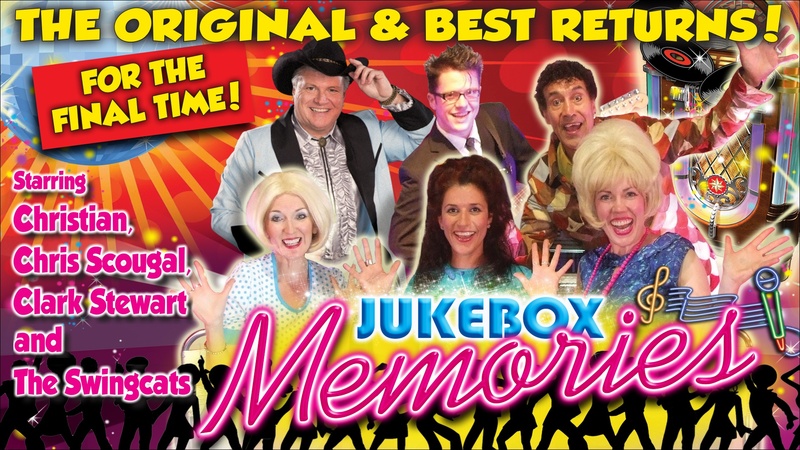 Do not miss this great Musical adventure with Jukebox Memories. Excellent show was there on Thursday night 16 of us mothers and caters with special needs adults they had a ball, Thought CHRIS Stewart was an excellent replacement for Dean Park. All the cast were absolutely fantastic. Fantastic. Gets better every time. A fantastic show all singers great so sorry it has to end . What a awesome show I have been to all of them but last night was the best only downside was your no longer allowed to get on your feet and join in the whole point in going to the theatre is to join in and have fun the wee man and woman dancing in the front row enjoying themselves and suddenly securetly comes in and tells them to sit down!!! after that no one was allowed to get on there feet and join in the whole point in going to the theatre is to join in and have fun as far as I’m concerned it will kill the theatre of..it wasted a awesome night.. Fantastic show. Was Liam Dolan Toni in the show? I was at the show on Saturday evening. What a fabulous evenings entertainment. I must congratulate the sound engineer as it was the best sound in live theatre that I have experienced on many years. It particularly showcased the awesome vocal range of Clark Stewart. Beautiful tone and power and with a ready wit too. Christian’s energy and enthusiasm was infectious. He loves to perform and Chris Scougal was on excellent form too. I was sad to hear that this is the last of an amazing 9 year run of shows. It was wonderful to be an audience member in a sold out show with such an engaged crowd. I really hope to see Clark Stewart on The Pavilion stage again soon showcasing his awesome talents. He is well worth the journey from Edinburgh and ticket price alone. If this show had run longer I would have been back. Congratulations to all involved in the production. It was a triumph. I was lucky enough to have a ticket for Jukebox Memories on Saturday evening. What a fabulous show! I have never experienced a better live theatre sound system. Whoever was in charge should be applauded. It did great justice to the awesome vocal talents of Clark Stewart, what a vocal range! I particularly loved his Elvis. Christian’s energy and enthusiasm and general love of music was infectious. Chris Scougal was on fine form too. I was sad to hear that the show was calling it a day after an awesome 9 year run. It was wonderful to see a theatre full to the rafters with a happy, engaged audience. I really hope that I see Clark again on The Pavilion stage displaying his awesome vocal talent and ready humour again soon. He is well worth the ticket price and commute from Edinburgh. I wish the run had been longer because I would have been back. Congratulations to all involved in putting this show together. I haven’t enjoyed an evenings entertainment so much in a long time. Who played tony tonight anybody?